The Coppeller (ヘソクリムシ?, lit. : "Stash Bug") is an enemy found in Hey! Pikmin. It is a small quadrupedal insectoid creature with flower petal-like wings that rotate like a helicopter's blades. It has large red eyes, a trait common to all scarpanids, two tiny antennae, and has a light green spot where its "propeller" part is attached. It has four dark green claws on each of its limbs, allowing the creature have a good grip on the objects it holds. The creature's whole body is green, and is about half the height of Captain Olimar. However, its propeller makes up most of it, so including that it's nearly the same height as the captain. It appears from offscreen in certain locations, and will fly around in a set path. They are known for carrying various objects, such as Sparklium Seeds, hearts, treasures, and even Pikmin. If the player doesn't kill them fast enough, they will fly offscreen and cannot be seen again. Coppellers spawn into levels carrying various items, including Sparklium, health, and even captured Pikmin. They fly in set patterns, but only stay on-screen for a limited amount of time; if they are allowed to escape, the items and Pikmin they hold will be lost. Coppellers can be killed with a single well-timed Pikmin throw. While Coppellers cannot directly kill Pikmin, any Pikmin they spawn carrying will be considered killed if they aren't rescued before their captor flies away. 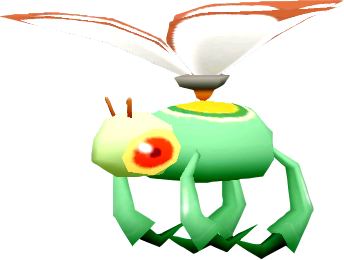 The creature's English name is a combination of "helicopter" and "propeller", coming from the way it flies, with a propeller. Its Japanese name translates to "Stash Bug", coming from the way it stashes various objects, and how it is very bug-like in appearance. The French, German, and Italian localizations use the American name while both Spanish localizations use the European one. This page was last edited on March 27, 2019, at 18:24.